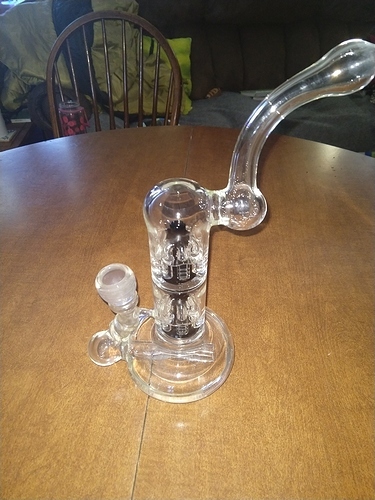 Do you own a super cool piece of smoking/vaping gear that you want to show off? Post those pics here! This is one of my favorite pieces. I’ve had it for over a decade but didn’t figure out the ‘right’ way to smoke out of it until about 3 years ago… It’s hard to make out in this picture, but the stem in the bottom chamber has slits in the bottom part; you’re supposed to hold it so that the normally horizontal stem is closer to a 45 degree angle… that way, any large ash the falls through, won’t be pulled all the way into the chamber (go to the sink and blow out the water when the ash goes in). If you’ve seen the Magicians show, there’s an episode that has a very similar pipe (but they don’t use it the ‘right’ way’)… I couldn’t remember which episode though. Nice piece! It looks like a tabletop chemistry set! Very cool!